How can youth get involved? Are you passionate about making a difference in your community? Committed to the health and well-being of others? Looking to gain experience? You don't have give a financial donation to make a difference. Your time, energy, and skills are just as valuable. We have many volunteer opportunities for youth and we feel that the involvement of youth within the Nicola Valley Health Care Auxiliary would be beneficial to both, youth and the Auxiliary. You can obtain hours towards your graduation requirements, gain valuable experience, and give back to your community. While we can benefit from your amazing talents, passion, and commitment. We provide three $1,500 scholarships per year to students graduating from Merritt Secondary School. Preference is given to students that have volunteered with our organization. 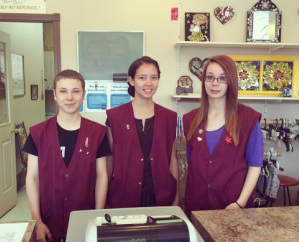 We hire students during the summer to work at the Thrift Shop. What are youth saying about the Auxiliary? JEEVAN, 20, completing a Bachelor of Arts in political science "Its a great way to meet all types of people from the Nicola Valley, and it being my second summer, I get to reconnect with all the people I met last summer". "I wanted to work at a place with a sense of purpose"
"I wanted to work with an organization such as the Nicola Valley Health Care Auxiliary where I'd gain valuable knowledge and experience to aid in my future career." "I enjoy thrift shopping, so why not work at a place that I love"